This weekly collection of ripped BodySpace members will push your motivation into overdrive! Get inspired to crush your fitness goals. We 'Mirin is the ultimate collection of photo inspiration. It's a powerful dose of fitness motivation. Every week, we showcase the hard work of BodySpace members who live life to the fittest. Their results will push you to train harder, live healthier, and demolish your fitness goals. You 'mirin? Get your weekly dose of 'Mirin motivation right here. This time, it comes in the form of amazing selfies! The weather might be cooling down, but don’t let that be an excuse to hibernate. Stay motivated to live the fit life by checking out these 10 shots. They’re the perfect reminder that hard work pays off! Hard work pays off, and these photos are proof. Check out these impressive physiques to harness enough drive to kill your workout. But first, take a selfie. This Father's Day, we pay homage to dads for all that they do. Take the day to celebrate family and fitness by checking out the inspirational physiques of men who work hard inside and outside the gym. These pumpkin chests are nothing short of amazing. Plus, they're just in time for Thanksgiving! There are some familiar faces and arms in this lineup, plus a few you may not have seen. Which one will inspire you to hit the iron? Kiss those pink dumbbells goodbye and take your lead from these strong women who push, pull, and press their way to 'mirin-worthy status. When you put in the hard work, it's important to document your progress. Take a peek at these snap-worthy selfies that will motivate you to crush your goals. Your votes have been cast and the numbers counted. 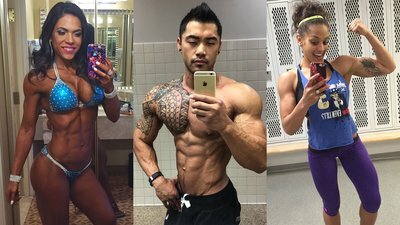 Here are the 10 Bodybuilding.com Spokesmodel Search finalists! Get motivated for your weekend workout. Scroll through these amazing photos and hit the gym! Scroll through photos of these 10 talented athletes and you'll have a month's worth of gym-spiration! Every once in a while, you see someone who has it all locked down tight: their training, nutrition, and their vision for who they want to be. 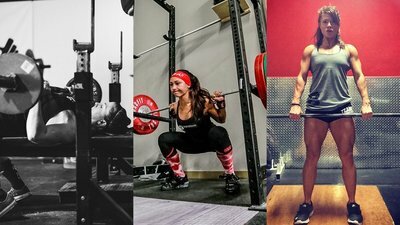 Get inspired by these stunning lifters who know what it means to grind! These 10 hardgainers prove that even the skinniest weightlifters can sculpt muscle worth 'mirin! They look great because they work hard. If you have aesthetic goals, follow their lead! Lights, camera, action. Soak up your daily dose of inspiration from these 12 BodySpace members that put the stunning in selfie. Even if your goal doesn't include stepping on stage, you can't deny the superior aesthetics of these 15 BodySpace members! Summer might be coming to a close, but that doesn't mean it's too late to flaunt your physique. Check out these 'mirin-worthy outside shots. These 16 BodySpace members prove what dedication to a solid nutrition plan can achieve! Labor Day means fun, relaxation, and food. Let these 16 BodySpace members be your inspiration to stay on track this holiday weekend! These 16 former twigs prove that a little hard work and a lot of food can produce amazing changes! Feast your eyes upon these 14 selfie masters and soak up some inspiration! These 15 BodySpace members are absolutely killing leg day! They're all the motivation you need to do the same. You may not be able to see your back in the mirror, but these 16 BodySpace members show just how amazing it can look. Never skip back day! A great workout begins and ends with a supportive partner. Check out these fit friends who push each other every day! These 19 individuals have built awe-inspiring physiques that forge a true bond between iron and ink. These 10 inspiring individuals will make you want to jump out of our chair and run right to the gym! Swipe over each photo to see the complete pictures! We're proud to call the United States home. Here, we can admire gorgeous bodies and beautiful scenery at one time. What could be better? Happy 4th of July! These 16 BodySpace members are the epitome of dedication and discipline. Scroll through for your perfect dose of inspiration. 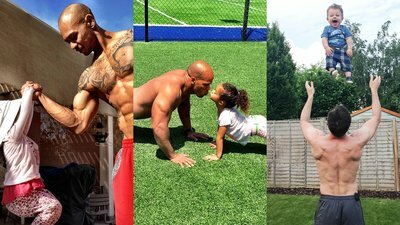 Being a fit father is not always easy, but these 18 guys sure make it look like it is. Happy Father's Day, Bodybuilding.com family! At Bodybuilding.com, Flag Day commemorates the raising of Old Glory and the incredible strength of our BodySpace members. Check out this collection of human flags! When it comes to building your best physique, consistency is key. Get motivated by these amazing people who stopped at nothing to build their best self. Feast your eyes upon these amazing, inspiring individuals and soak up all the motivation you need! We 'Mirin Volume 106: Super Moms! Happy Mother's Day to all the fit moms. You inspire us all! We 'Mirin Volume 104: Strong As F*ck! Our BodySpace members not only look amazing, but they're also incredibly strong. We're definitely mirin' these big lifts! These 21 motivating individuals got back to the grind and carved bodies worthy of celebration! Lace up your sneakers and get ready to hit the gym. But first, check out these selfies. This time, Carly Simon is wrong. The 100th volume of We 'Mirin IS about you: you and your insane vascularity! Having trouble sticking to your New Year's resolution? Here are 16 reasons to reignite your motivation. Transformations aren't always about losing body fat. Check out these inspiring people who put on serious muscle! The votes are in. Let's salute the 10 finalists in the Bodybuilding.com Spokesmodel Contest the best way we know how: by 'mirin! What do you get when you combine love for the holidays with love for the iron? You get these 17 glorious photos! Has it been awhile since you've taken a progress photo? Check out these 16 selfies for posing ideas and muscle motivation! We know: the week just doesn't feel right without a volume of We 'Mirin! Here are 15 more insane physiques to inspire your workout! BodySpace always delivers! Here are 15 excellent physiques for your fitspiration. Check out these 20 skinny-to-swole transformations! They're sure to inspire the hardgainer in all of us. These 18 photos show how good leg training can take your physique to the next level. Rectus femoris, vastus lateralis, and vastus medialis, we salute you! Some think cellphones don't belong in the gym. We disagree. How else do you take a swolfie? Here are 22 photos that prove a cellphone, a mirror, and great physique make magic! Summer might be slipping away, but that doesn't mean we don't have a reason to appreciate excellent abs. Here are 20 motivational photos! Fit bodies are hot. Fit bodies are extra hot when they're accentuated by awesome ink! Check out these 20 motivating photos. This weekend, the Cosmopolitan of Las Vegas will host the 2014 WBFF Worlds. Here are 18 talented competitors who worked hard to earn their rep! Beauty, fitness, fashion? We 'Mirin! Zyzz had, and still has, an enormous impact on the community of Bodybuilding.com. Although he's no longer with us, we want to salute the king of aesthetics. Here's to you, Zyzz. We're still 'mirin. Fitness and friendship go together like peas and carrots. Here are 16 awesome examples of fit friends who motivate each other to build their best selves! Warm weather, ripped bodies, and awesomely shredded physiques. We declare this season the summer of swole. Check out these 15 BodySpace members sporting their summer wear and proving that working hard all year pays off in the summer months. For the Bodybuilding.com community, no holiday is complete without a collection of awesome physiques. This Independence Day, we salute Old Glory with muscles! You need motivation? We've got your motivation right here! Check out these 18 photos of seriously good physiques. We 'Mirin Vol. 68: 22 Transformations You Have To See To Believe! Congratulations to the Dymatize $100k Challenge winners and finalists! Your hard work and dedication to achieving your goals makes us all proud. We 'Mirin Vol. 66: 35 Super-Fit Mothers! Mother's Day is the perfect time to celebrate moms who balance health and fitness with raising a family. Check out these 35 amazing mamas! Gym motivation can be hard to come by! Good thing you stopped here. Scroll down for all the fitspiration you need. Check out these 25 incredible people who have turned their skinny bodies into strong, aesthetic works of art. Get inspired to achieve your own scrawny to brawny transformation! To celebrate our reaching 2 million Facebook followers, you sent us some incredible pics that proved why the world should be 'mirin you. Congrats to the winners! Today, we honor fashion and fitness. Check out these 15 shredded BodySpace members who are making their jeans proud! Our annual contest started with a field of thousands. We whittled down to 10 finalists to compete at the 2014 LA Fit Expo. Use these images to inspire you! This is your year! These 15 young athletes are the future of the fit world. Let their growth inspire you to make new gains! If these 15 amazing triceps shots don't motivate you to crush some skull-crushers, we don't think anything will! In the deep cold of winter, we need a little heat. Use this fuel to roast your resolutions! We 'Mirin: We scoured BodySpace to identify admirable physiques with quality ink. Art is an expression of the self. Fitness is its activation. These university students practically have a degree in living ripped. Get motivated to crush your own fitness goals with these 20 inspirational shots! These 15 Optimum-sponsored athletes are the real deal. Their amazing photos will inspire you to hit the weights hard and build your best self! 'Tis the season to make some mass. Get fired up to build maximum muscle with this collection of 20 stacked BodySpace members! Smash and surpass your fitness goals with this inspiring collection of 20 shredded college students who have learned to live ripped! Skip the tricks and treat yourself to this selection of 26 ripped BodySpace members. Costumes can't disguise a great physique! These 20 college students from our Stacked Student Search know what it takes to live fit. Check their pics and get inspired to crush your own health and fitness goals! It’s time for another powerful dose of photo motivation. Get inspired to exceed your goals with these 15 shots of ripped Optimum athletes! We 'Mirin Vol. 41: 18 Bodies You Have To See! Take your weekly dose of photo motivation and get inspired to hit the gym, move some iron, and smash your fitness goals! The world's top bodybuilders didn't always look that way. To start Olympia Weekend, check out the before and after pictures of the all-time greats! Need a dose of transformation inspiration? Look no further. These 17 BodySpace members radically changed their physiques, and they've got the photos to prove it! Celebrate the seat of your power with this inspirational collection of 16 strong glute and hamstring shots! Check out these 20 amazing BodySpace photos for a powerful dose of instant motivation. Get to the gym, smash your workouts, and exceed your goals! Check out these 16 amazing transformations for a powerful dose of instant summer motivation. Get to the gym and exceed your goals! We 'Mirin Special Edition: Red, White, And Swole! Today, we celebrate the land of the free weights and the home of the brawny. Happy Independence Day! These 20 incredible self-shots will inspire you to train like a machine and smash your fitness goals! Strength, shape and definition; find it all in these 20 incredible photos! These guys are ripped, strong, and fit. But most importantly, they're fathers. Celebrate their special day! These 18 people prove that Bodybuilding is an art. They carved their bodies with the hammer of nutrition and the chisel of the weight rack. These 17 incredible transformations will motivate you to get up, get fit, and absolutely obliterate your fitness goals. Transform today! Sometimes, we forget why we're in the gym. Take one scroll through these incredible photos and you'll remember why you train hard and heavy. We 'Mirin Vol. 26: 19 Unreal Physiques! Want a body you can show off? Get inspired by these 19 insane physiques! Don’t spend your weekend in front of the television. Rain or shine, get to the gym and crush your goals. Get motivated with these 17 inspirational physique photos! Are your resolutions on the rocks? Don’t let them sink. Check out these 16 amazing transformations for fitness motivation! Check out these 15 incredible physique photos to fan the flames of your inner fire! Get motivated, get to the gym, and crush your goals. Scope out these 17 incredible self-shots for a power-packed dose of instant motivation! It doesn't get more ripped than this. Every so often, you have to stop, smell the roses, and ‘mire yourself in the mirror. 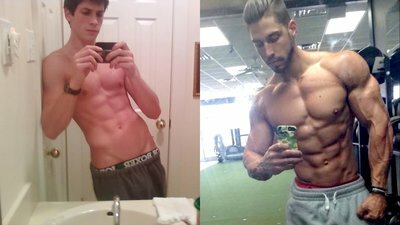 Get inspired to build your own masterpiece physique with these 15 incredible self-shots! Get inspired to finish January strong with these 17 incredibly ripped physiques. Crush your goals, transform your body, and hit the gym with everything you’ve got! We 'Mirin Special Edition - We Tirin! Time to burn rubber and ‘mire some tires! Get motivated with this epic photo collection of tire flips, slams, sits, and lifts. Light the fires and kick the tires! Don’t let the holidays hinder your goals! Get inspired to hit the gym harder than ever with this collection of 15 unbelievable BodySpace physiques! We 'Mirin Special Edition: Calling All Quads! Leg development separates the pretenders from the real deals. So we searched BodySpace for the craziest leg pics we could find! Boo! 63 shots of ripped, costumed, inspirational BodySpace members. When Gotham is ashes, you have our permission to ‘mire. The example set by these extremely dedicated individuals gives us all something to aspire to. Give away your complacency and learn to live without fear! This is your life. Lift it. We 'Mirin Vol. 16: 15 Goal-Inspiring Physiques! Get ready to wipe your jaw off the floor. This collection of limit-crushing, muscle-bearing, ripped BodySpace members will push you to train harder than ever. These perfect BodySpace physiques will push, drive and motivate you to hit the gym with everything you've got. Your workout is calling. Go crush it! We 'Mirin Vol. 7: 15 Traffic-stopping Bodies! We 'Mirin Vol. 5: 15 Physiques That Will Blow Your Mind! This awesome selection of incredible BodySpace bodies will push you to train like a champion. Get motivated, get inspired, get to the gym!